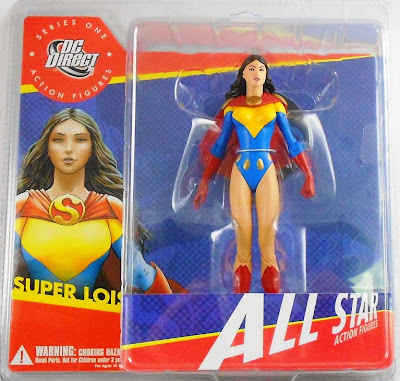 She's Fantastic: DC Direct All-Star SUPER LOIS! DC Direct All-Star SUPER LOIS! A common reoccurring story in the world of Superman is that of Lois Lane temporarily gaining superpowers. I will actually be reviewing another great example of this character twist tomorrow, but today is my favorite of the two. All Star Superman was a great comic that ran from 2006-2008 with the creative talents of Grant Morrison and Frank Quitely. The series attempted to boil-down the Superman character to his essential points over the course of 12 issues. It was a success and received numerous awards. Issue three of the series rehashed the classic "Super Lois" story in a fantastically modern way. In the story, Superman presents Lois with a suit constructed of his own DNA for her birthday. This gives her 24 hours of superpowers that reads like a fairytale date movie. I loved the issue, and I loved how DC Direct surprised us 2 years later with this fantastic action figure commemorating the story. Let's check her out below! The sculpt by Andy Bergholtz is great. It really portrays a great blend of Frank Quitely's art combined with more generalized features (I don't think a straight-up representation of Frank's art would be the best look for 3-D). The leg articulation makes her look a little knock-kneed, but it really suits the character and from most angles she looks amazing. 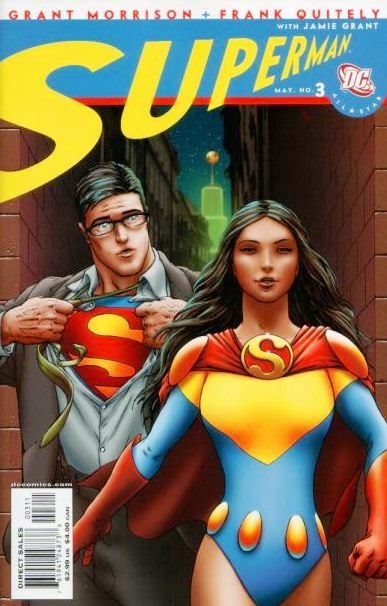 Here is the issue of All-Star Superman that gave us this amazing costume. Her articulation is simple but functional. This costume also got some love in the Heroclix world! thanks! She's surprisingly cheap on ebay. I ususally steal my in-package pics from ebay auctions and the prices were a lot lower than I expected. It is a great design. Another must! Arg! But a adore Quitely so is a no brainier. Thanx!